On January 28, 2017 Chinese New Year will be celebrated, ushering in the Year of the Rooster. To mark the occasion many fine watchmakers have followed up on last year’s popular Year of the Monkey timepieces and created limited edition watches inspired by the only bird in the Zodiac. Whether you will be joining the Chinese New Year parties or not, these stunning timepieces are worthy of a place in anyone’s collection. 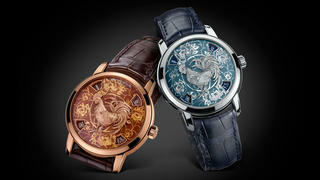 Ulysse Nardin’s annual Chinese New Year timepiece once again takes the form of the elegant Classico. Focussing on capturing the rooster’s natural energy, Ulysse Nardin has employed the traditional champleve technique - where engraving is performed directly to the dial before enamel is applied - to create a detailed and majestic depiction of the bird. Housed in an 18 karat rose gold case, the Classico Rooster will be available as a limited edition of 88. Vacheron Constantin is another Swiss fine watchmaker employing highly skilled Métiers d’Art techniques for its Year of the Rooster offering. 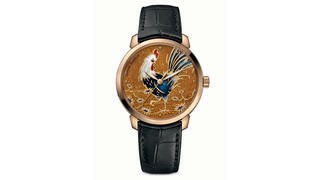 Available in both orange and blue colourways, Vacheron Constantin’s Year of the Rooster watches use a combination of engraving imagined in the style of Chinese Jianzhi paper-cutting and Grand Feu enamelling to achieve an intensely hued and intricate image of the rooster surrounded by a floral motif. 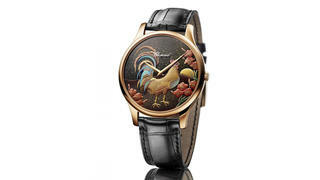 Chopard has once again teamed up with Japanese firm Yamada Heiando to create the beautiful hand-painted dials on its Year of the Rooster limited edition. The lacquer used in the process is harvested from the Urushi tree once a year and applied within mother-of-pearl cells to create an iridescence in Chopard’s rooster, which is shown next to eight gladiolas. The 88-piece edition is housed in an 18 karat rose gold case and powered by the L.U.C. 96.17-L self-winding movement. 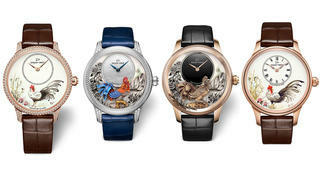 Famous for its artistic creations, Jacquet Droz has created no fewer than four exquisite limited edition Year of the Rooster watches, each within its Petite Minute Heure collection. 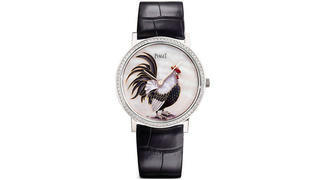 The first watch features a rooster sculpted and painted in white gold on a painted floral background with a diamond bezel and the same design is also available in a rose gold version without diamonds. The final two watches both share the same Grand Feu enamel dial in which the rooster is picked out on a plain white background - this version is also available both with and without diamonds. For its 2017 Year of the Rooster watch Piaget has collaborated with enamel artist Anita Porchet to render their bird in Grande Feu cloisonné enamel on a mother-of-pearl dial. Each rooster is hand-painted by Porchet in chic tones of grey, black and white with a contrasting comb and wattle in bright red. Housed in a 38mm ultra-slim white gold case set with diamonds, the 38-piece limited edition is powered by a Piaget 430-P manual wound movement.